You can see some of his documents here, including tables of symbols he worked out. 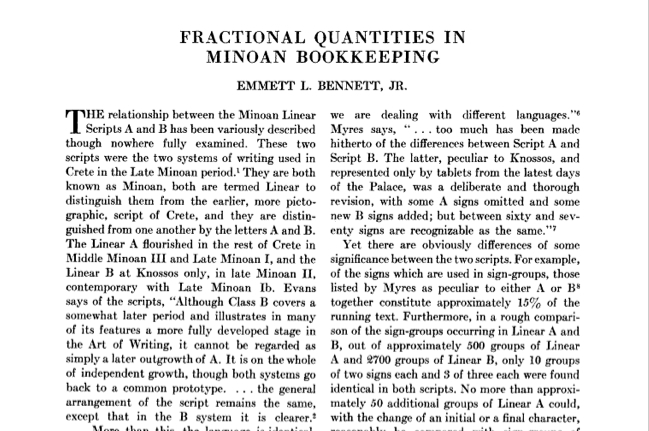 You may think that a Classics prof working on ancient clay tablets wouldn't be too cutting edge, but he was using punch cards back in the 1940s, held a patent (it looks like), and worked to figure out ancient bookkeeping. For now, it's another reminder of the Wisconsin tradition, not only in ancient languages but also in the use of new technologies and the value of thinking broadly. 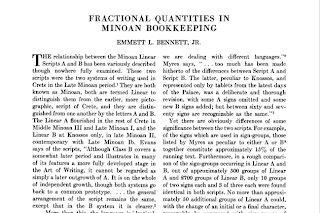 Image from here, the first page of a piece in the American Journal of Archeology from 1950. ANOTHER major figure in the field in the mid-20th who worked at UW? Time to reclaim that tradition. I don't think those of us working here fully appreciate what a rich history there is in our field here. Hi and happy New Year to the Mr Verb team! On the subject of the development of written language, a five-part series introduced by Melvyn Bragg began this morning in UK on Radio 4called 'The Written World'. Thanks! We'll keep an eye on that and try to post on it if we can.